Silent self-closing lid and positive leverage foot pedal allows for hands free operation while controlling odors and the containment of infectious waste. Ideal for anywhere a quiet environment is desired. Heavy-Duty institutional quality steel step cans. Self closing piano hinge lids. 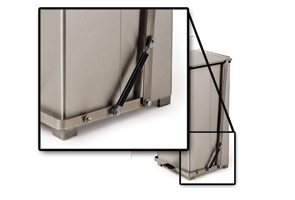 Folding retainer bands hold can liners securely inside. The Silent Defenders™ comply with OSHA standards and meets federal OBRA regulations. 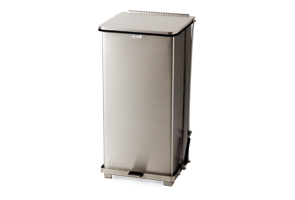 Ideal for anywhere a quiet environment is desired these medical waste containers are constructed from a non-magnetic stainless steel and are available in stainless steel, powder-coated red and powder-coated white.